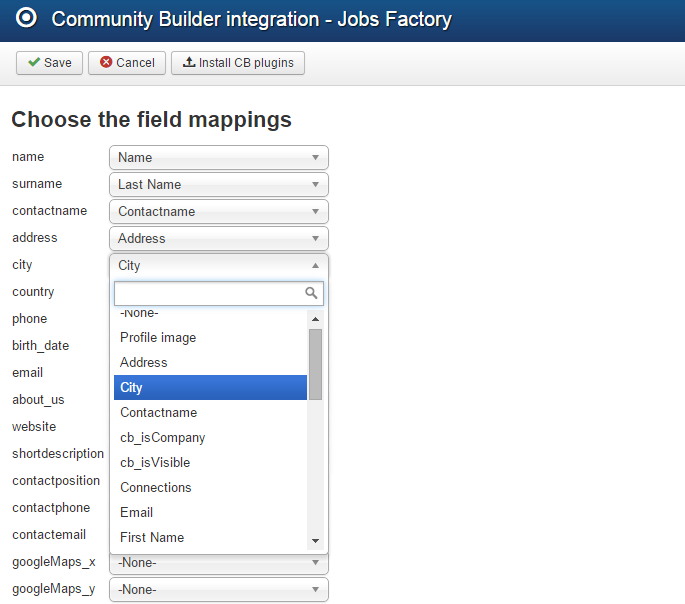 Jobs Factory allows you to integrate Community Builder as an alternative profiling system. Jobs Factory will automatically install CB plugins if it detects it upon installation. In order to use the CB profile, you must go to Components/Jobs Factory/Settings/Profile Integration and set the User Profile field to Community Builder, then click on Save. Furthermore, you will need to set up CB by mapping the corresponding fields. Click on Setup fields assignments to assign them. CB comes with some assignable generic fields, but you will also need to create your own to assign the Jobs Factory fields to the ones from CB. This can be done by going to Components/Community Builder/Field Management. Here you will need to create two fields (cb_isCompany and cb_isVisible with values 1 or 0) to be mapped with isCompany and isVisible on the Set up field assignments page. For Candidates profile also has required fields to be mapped with Surname and Birthdate. Correct field mapping will be required to display information properly between the jobs, profiles and other plugins. If CB was installed after the jobs component, you will have to click on the Install CB plugins button which can be found at the top of the Field Assignment Area.